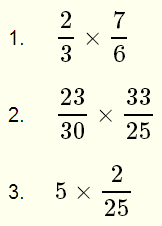 Fractions multiplication: Several examples with detailed solutions and exercises with answers on are presented. A calculator to multiply fractions is included in this website. Example 1: Multiply and simplfy, and express the final answer as a fraction. Example 2: Multiply and simplify, and express the final answer as a fraction. Example 3: Multiply, simplify and express the final answer as a fraction. Exercises: Multiply, simplify and express as fractions.